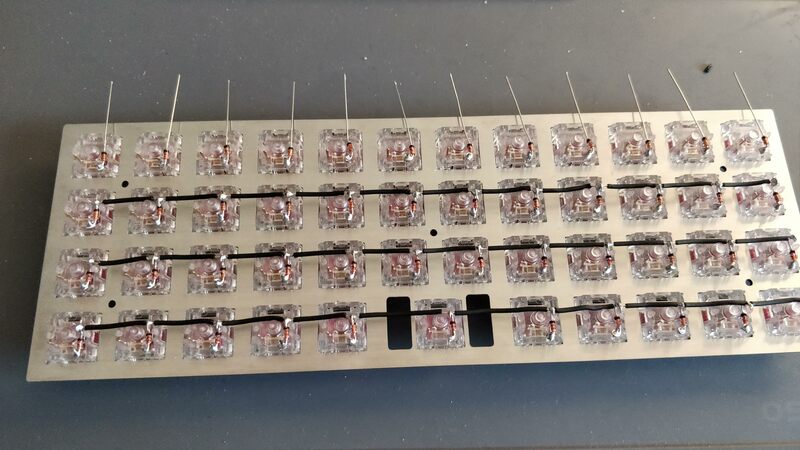 In the handwired build log part 1 we saw a technique to build a nice keyboard matrix without using a PCB. In this part we’ll discover how to hook the teensy controller to the matrix. This is a special connector normally used to solder a ribbon cable to a PCB. 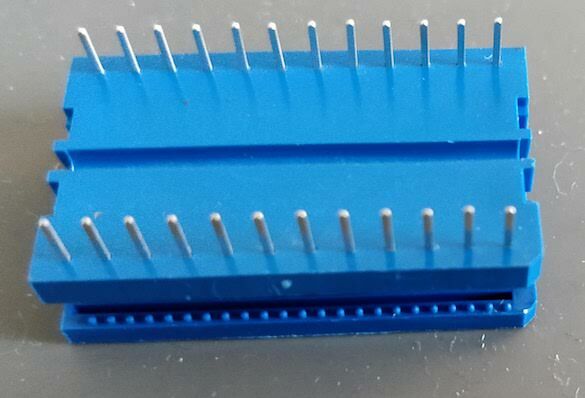 This connector has the same footprint as a teensy, so instead of soldering it to a PCB, we’ll solder the teensy on the connector. 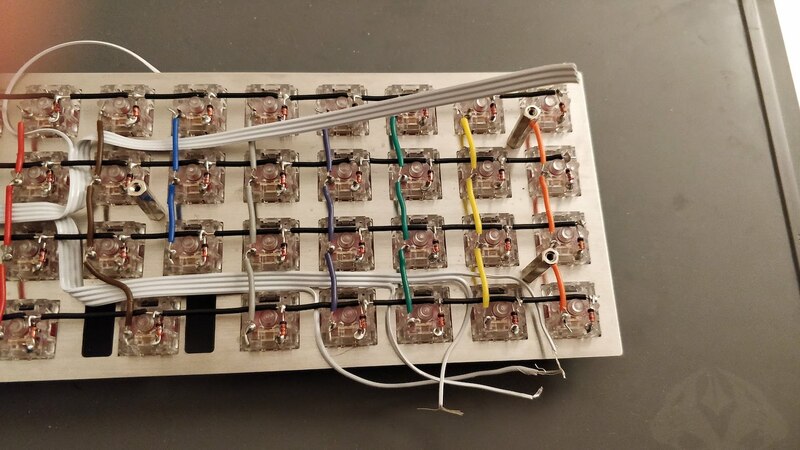 For the controller to read the matrix we need to wire each row and each column to a given port on the MCU. The good thing is that any port will do it, we don’t need to wire specifically a column or a row to a specific port (this would have been different if we had backlight leds which work better with a PWM capable pin). 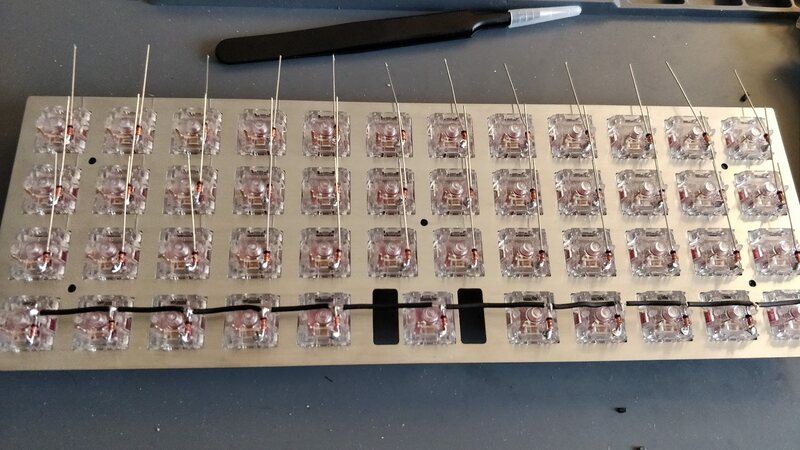 I didn’t plan any case, but I want in the end to put a transparent PMMA bottom on which I could glue the controller. Since the plate has 5 M2 screw holes, I plan to secure the bottom plate through these holes by using the screws and five PCB brass spacers. We have 12 columns and 4 rows in the matrix, all those needs to be connected to the MCU ports. That means we’re going to use 16 conductors out of 24 on our ribbon cable. For aesthetic reasons, and since 12 is a multiple of 4, I’ve splitted the 16 conductors ribbon cable in 4 pieces of 4 conductors. 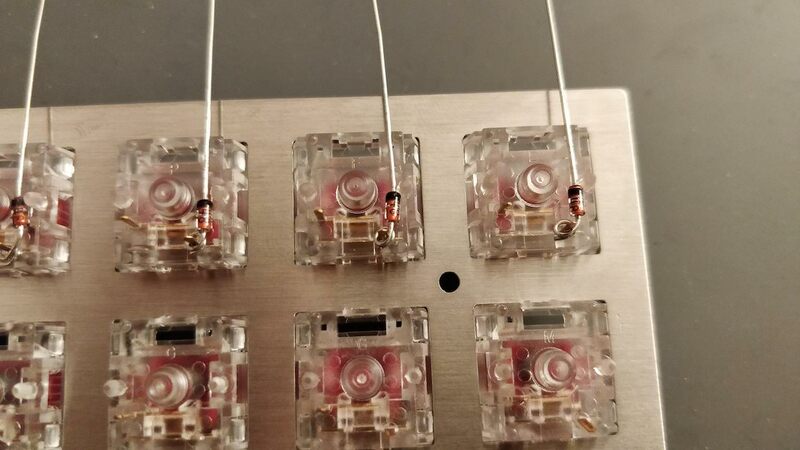 The idea is to route the 4 conductors ribbon up to where the individual connector will be soldered to the matrix. The big difficulty is to plan the length of the 4 conductors ribbons and when to split them in individual conductors. Again for aesthetic reasons, I decided to keep the conductors bound together in the ribbon as much as physically possible. 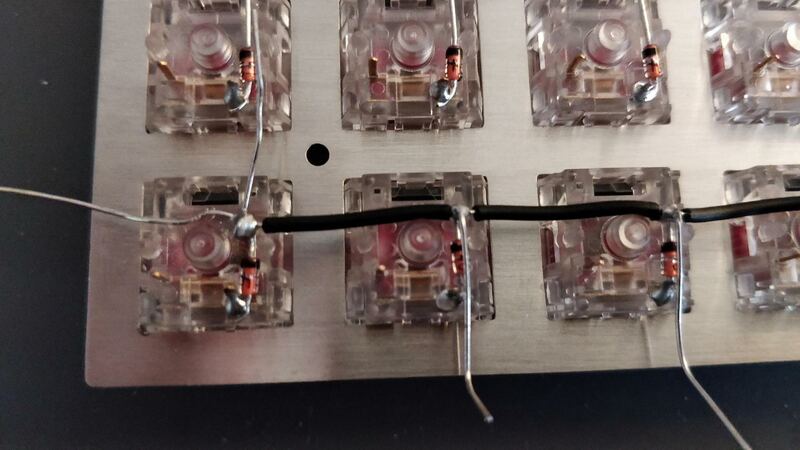 The other good news is that a small ribbon of 4 conductors is about the same size as the distnce between 2 switches. So I can route those ribbons easily under the matrix wires and between the switches up to their respective destinations. For aesthetic reason again, I decided to route all the ribbons starting from the controller at the same place in the back of the board, and make some 90º turns when needed. So I need to route them sorted by length (ie start by routing the longest ribbon and finish by the smallest one). As you can see in the picture, the ribbons turn around the brass spacers. I started routing from the middle lane which was free of spacers until the middle of the plate, then move up or down to access the needed columns. One thing I didn’t plan very well was that I wanted the controller and its USB port to be on the left of the keyboard. But I did the routing from the left when the keyboard was on the front, so in the end the controller happens to be on the right side. Unfortunately it was to late to change it when I noticed it. Then it is a matter of cutting the conductor to the right length and remove the insulator. Usually it is not possible to use the wire stripper because it requires a large distance between the cut position and the end of the cable which is not possible when the conductor comes from the plate. I had to remove the insulator using a sharp knife and my nails. The very next step is to route the last 4 conductors ribbon to the rows. The simples solution was to split the 4 conductors ribbon into 2 parts, one going up and one going down. Then solder the wires to the rows on the same column. The first step is to crimple the DIP support on the ribbon cable. To help aligning the 16 conductors ribbon, I kept the unused 8 conductors part (this way the ribbon can’t move while closing the support). To prevent any electric short between the controller and the switches, the controller is placed upside down, so the support pins are facing down in usual conditions (so the pins are facing up when the keyboard is reversed as in the picture). Before soldering the controller to the support, I used the multimeter to make sure all the support pins are correctly connected to the matrix. To do that place the black electrode of the multimeter to one of the pin and check it is connected to the correct column or row. Then solder the Teensy controller. It’s not easy as the Teensy PCB pads are very small, so better use a magnifying glass and a very small solder diameter (0.6mm for instance). To program the controller we’ll use QMK. 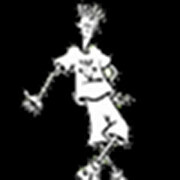 This is an open source keyboard firmware forked and enhanced from TMK. It supports a miriad of custom keyboards and MCU (including various ATmega and ARM micro-controllers). On macos it requires Homebrew. You should obtain the gh60_default.hex file. You can remove it, we won’t use it. QMK supports many keyboards and many layouts (called keymaps in QMK) for each keyboard. A keyboard is defined by a directory in the keyboards/ folder, and each keymap is also a directory in the keymaps/ folder of a keyboard. To build such keymap, one need to use the make <keyboard>:<keymap> command. The make command produces a hex file that can be flashed on the controller with QMK Toolbox, which is the recommended method. We can flash from the command line if we know the controller bootloader type, but QMK Toolbox is able to autodetect the correct bootloader, check the file size and so on. QMK Toolbox also acts as a console for the controller allowing to see debug statements. For the Teensy, we’ll use the “halfkay” bootloader. 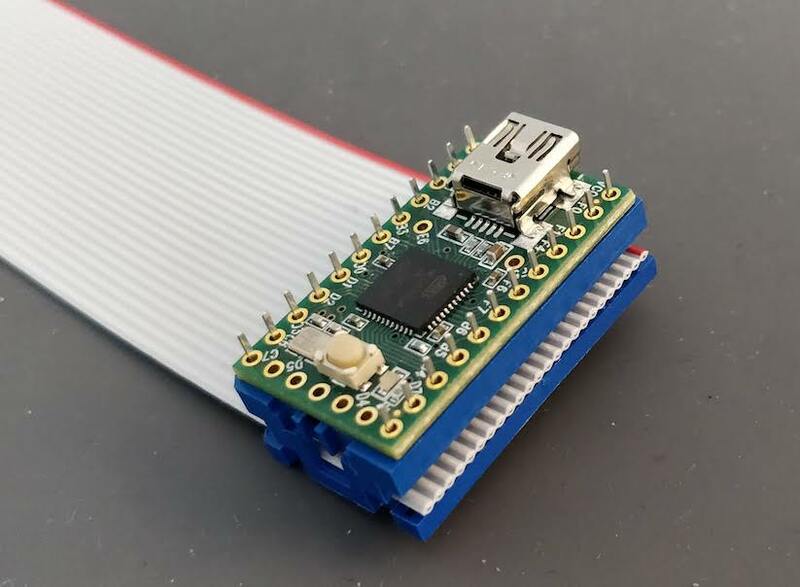 One advantage of the Teensy compared to the Pro Micro controller (which we could have used), is that the bootloader is very forgiving: for instance a Pro Micro can be bricked if we flash a firmware that is too large for it. You can find all the files in my QMK Handwired Planck branch. We defined here that the matrix is 4x12, and the ports of the rows and columns (in increasing order). 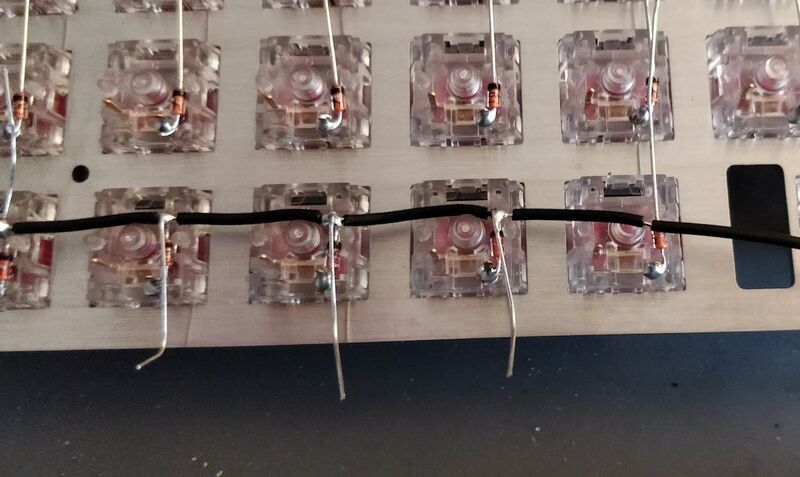 Also, we tell QMK that we hooked the diodes between the columns and the rows. I then created the default keymap. Since this is a Planck replica, I copied over the default Planck keymap of the MIT (2u space) layout. A keymap is a folder in the keymaps/ folder. Usually the layout is described in the keymap.c file. This keymap is a 3 layers keymap (base, raise, lower). The base layer can be either qwerty (the default), colemak or dvorak. A layer is a 2D array representing the keycode associated with a matrix switch. A keymap is an array of layouts (see the keymaps symbol in the keymap.c), one per layer. The keyboard can be in only one layer at a time, and can be programmed to switch to a given layer with a key combination as explained below. All the people I showed the keyboard asked my why the Esc key is placed below the Tab key. I’m assuming that the original Planck layout has been built this way to enhance the VIM experience. This way the Esc key is on the homerow and can be reached without moving the left hand. The LAYOUT_planck_grid macro has been defined in our planck.h file. It just maps a keycode to a spot in the layer array representing the matrix. The MO(layer) macro allows to temporarily activate the given layer when the key is pressed. Since on a 40% keyboard we can’t have access to the numbers, function keys, and most of the symbols, those are placed on a different layer than the regular direct access keys. The two raise/lower keys can be actionned by the left and right thumb while at the same time pressing another key to obtain the number or symbol. This is very efficient. The _______ is an alias for KC_TRANS which means that this key isn’t defined in this layer. When pressing this key while being in this layer, the keycode that will be emited is the first one to not be KC_TRANS in the layer stack. That means that Enter for instance is still Enter in any of the RAISE or LOWER layer. The rest of the keymap.c file contain special code that overrides the default QMK behavior. In QMK, a keyboard can override some functionalities, and a keymap can override the keyboard override. For instance we overrode the process_record function by defining the process_record_user function in our keymap. This is a function which is called each time a key event happens (a key pressed or released). In our case, this is used to switch to a different base layer when going to the ADJUST layer and pressing a base layer key (for instance it is K to switch to colemak). The ADJUST layer is obtained by pressing at the same time the LOWER and RAISE keys. We also overrode layer_state_set_user to make the LOWER + RAISE = ADJUST layer switching work. The layer_state_set_user function is called whenever QMK is switching to another layer, giving a chance to modify the target layer. We used update_tri_layer_state to return ADJUST when we switched to both LOWER and RAISE. Our firmware is in the handwired_planck_default.hex file. At this point your computer should recognize that a new keyboard has been connected. If you press any switches it should produce a letter. You can now test the keyboard and the keymap with the Keyboard Tester. It can be hard to find nice 40% ortho keycaps. I used the MDA Big Bang set. 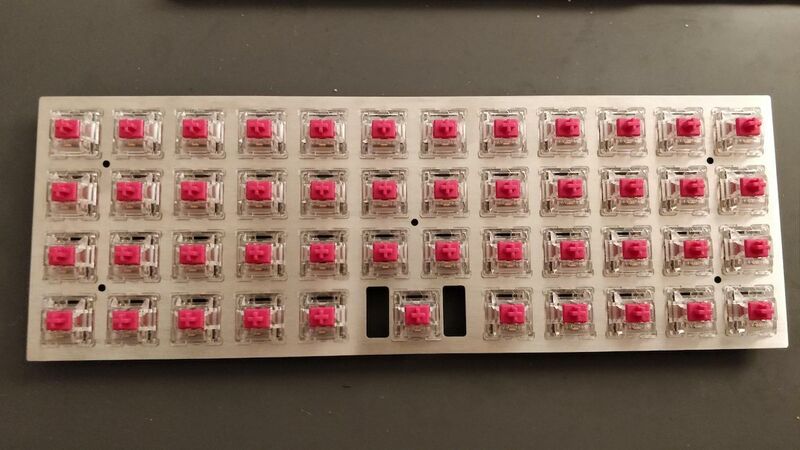 It’s a nice, smooth (and not that expensive) thick PBT keyset with dye-sub legends that covers a wide range of ortholinear keyboards, including the Planck. The MDA (also called MIX or EDRUG) profile is a newer key profile that we could call the little brother of the SA profile. It’s less sculpted than SA, but still more than the other profiles. 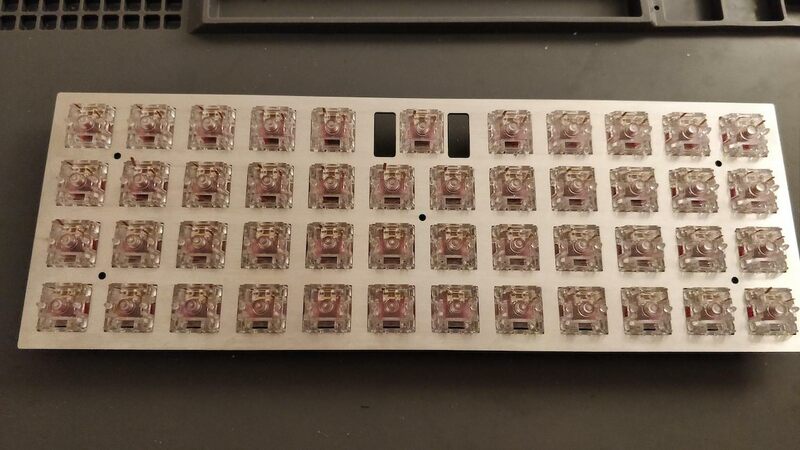 I haven’t had the time to work again on the keyboard, but I want to make it a bit slimmer (it has currently a height of 2cm not including keycaps and switches), and add a transparent bottom plate with small rubber feets. I plan the bottom plate to be a transparent plexiglass plate (so that we can see the matrix), cut at the size of the metal switch plate. The complex part will be to correctly align the holes for the brass spacer screws along with making sure the hole head fits inside the plate. To reduce the keyboard height, I will have to carve a small part of the bottom plate so that a small part of the teensy height can fit inside. If possible, I’d like to build a full case made of plexiglass. I need to design it properly and find the correct tools to do that. This will probably be the part 3 of this series! Update 2: The plate I’m using has a height of 1.5mm, not 2.5mm as some astute readers have pointed out. For the last 7 months, I’ve been discovering a new hobby: DIY mechanical keyboards. I’ve been using mechanical keyboards for ages (I was mostly typing on a Code keyboards lately), but lately moved to type only on my macbook keyboard (hopefully this is an early 2015, so the keyboard ie bearable). 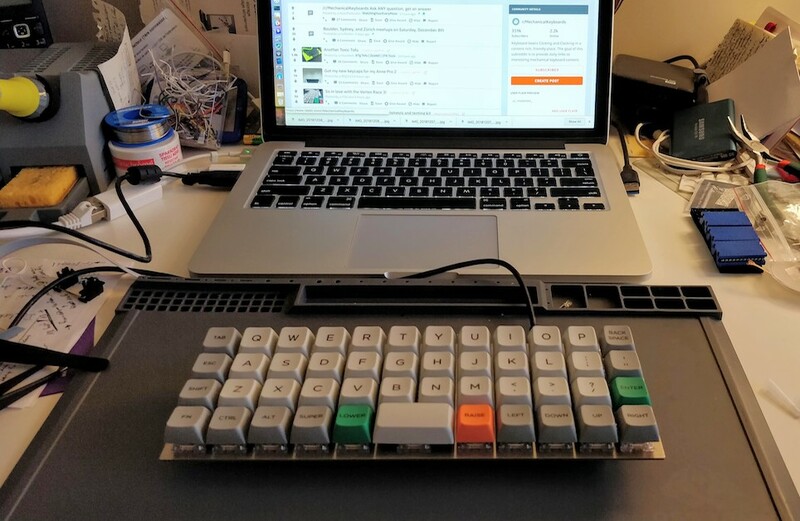 So 7 months ago, I was browsing the Internet when I discovered a new world: there were passionate people that are building their keyboards and even programming them with QMK. 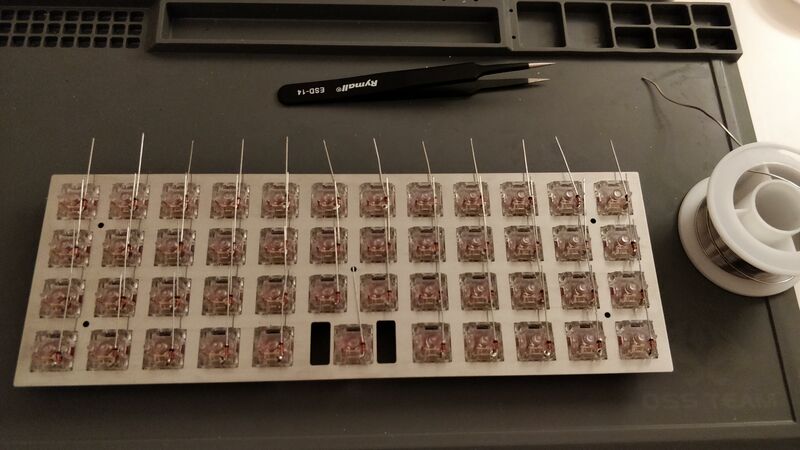 Forward to a month ago, I discovered that some people were building their own keyboards without any PCB, I then decided to try following the best handwiring guide with one of the smallest existing keyboard. So in a very fast loop, the controller’s firmware will power on one column of the matrix and “read” the tension back on the matrix rows. If there’s some tension on one row given current on a column, then the controller can deduce which switch has been pressed. 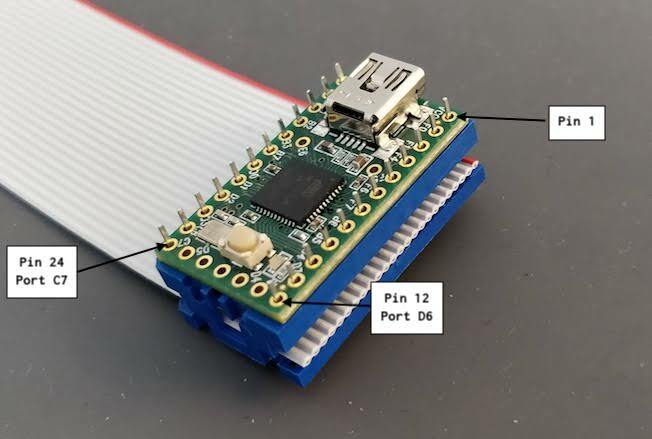 The firmware will then send the corresponding keycode based on the layout to the USB port, and continue with the next column and so on infinitely. When the controller will power the Col0, and if K00, K01 and K11 are depressed simultaneously, the controller will read current on both Line0 and Line1, because the current will flow from Col0 to K00 pin 1, then pin 2 because the switch is depressed, then to switch K01, then to switch K11, then to Line1. For the controller it is as if all the switches have been pressed, instead of the 3 that were indeed depressed. In the same hypothetical scenario as before, the current will be prevented to flow back from K00 to K01 and from Line0 by the D01 diode. Thus when powering Col0, the controller will only see a tension on Line0. 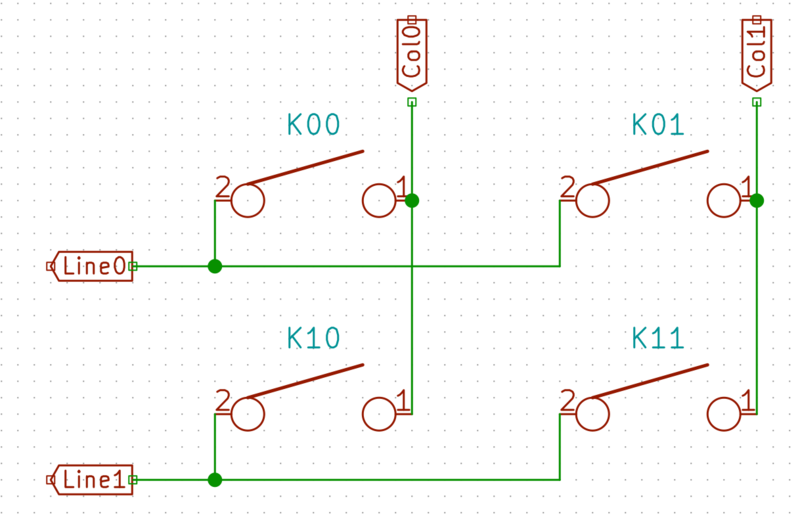 And when powering Col1 it will see a tension from Line0 and Line1, thus registering 3 key presses. Handwiring as its name implies is an electronic technique of building electronic circuits without using a PCB, and instead wiring all components one by one manually with small electric wires. It is often used to perform prototype of electronic boards. 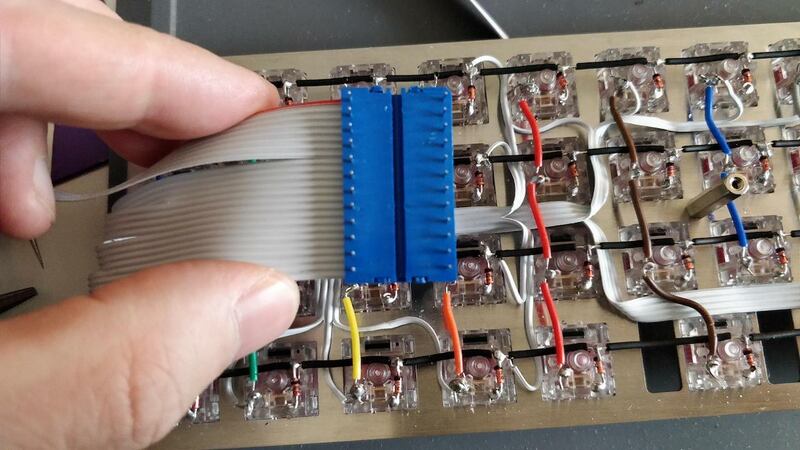 The aim of this build log is to show how to wire a fully working (but small) keyboard. 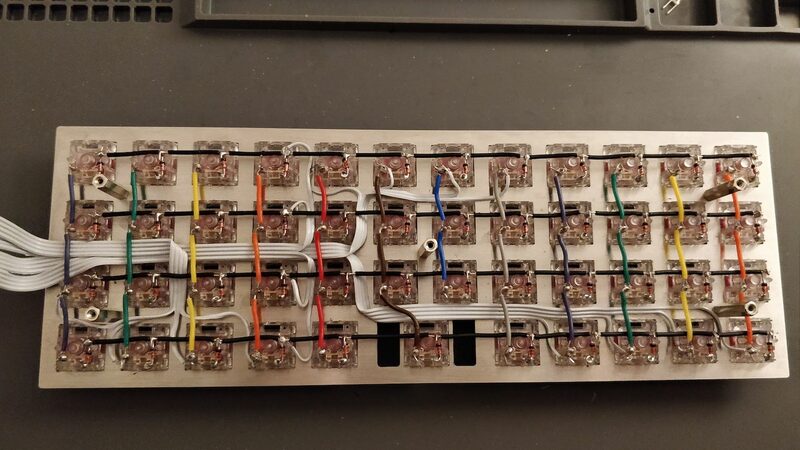 We’re going to build a Planck like keyboard in MIT layout, that is a matrix of 4x12, with a 2u spacebar, accounting for 47 keys. I chose this keyboard and layout because it’s one of the smaller keyboard (a 40%) and it is ortholinear (all switches are aligned) making it easy to wire. a planck plate (which I purchased pre-made by Laserboost). You can get one either from them or Lasergist if you send them the CAD files. You can easily get the CAD files from the KLE layout tool and swillkb. I choose a 1.5mm metal plate to make sure it is sturdy enough to type on it. a controller: teensy 2.0. It can be a Pro Micro or even the newer QMK Proton C.
Note that this plate has holes for a PCB mount stabilizer for the 2u space bar. I should have taken a version for a plate mount stabilizer, because with a PCB we won’t be able to put a stabilizer under the space bar. a wire stripper. Being in Europe I got myself a nice Stanley one. You can get a Vise Grip or any other tool like this one. You might need to tune it’s strength (there’s usually a small knob on the tool) so that it doesn’t cut the small wires. In this part of the story, we’ll only need the wire stripper, some colored wires, the plate, 47 switches, tweezers, a multimeter, the wire cutter, solder and the soldering station. 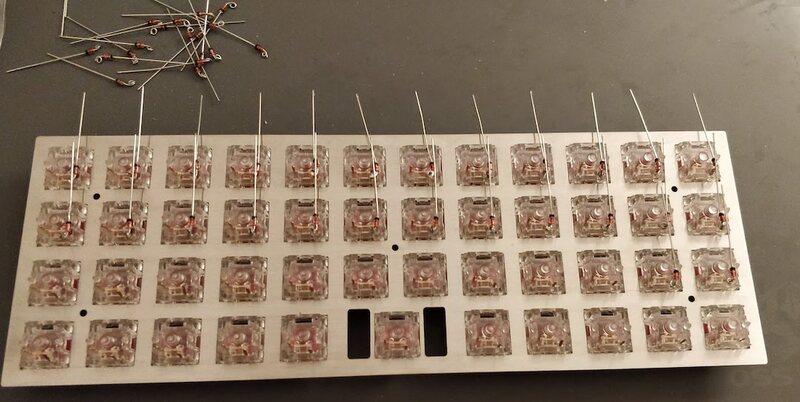 I put the switches facing north (the led hole is at the top) so that the higher pins when seen from the back of the plate will be the pin connected to the rows, and the other one will be connected to the columns. With a 2.5mm plate, the switches should clipse correctly on it. Make sure the plate is using MX switch holes without “top-opening” punches (straight square holes). 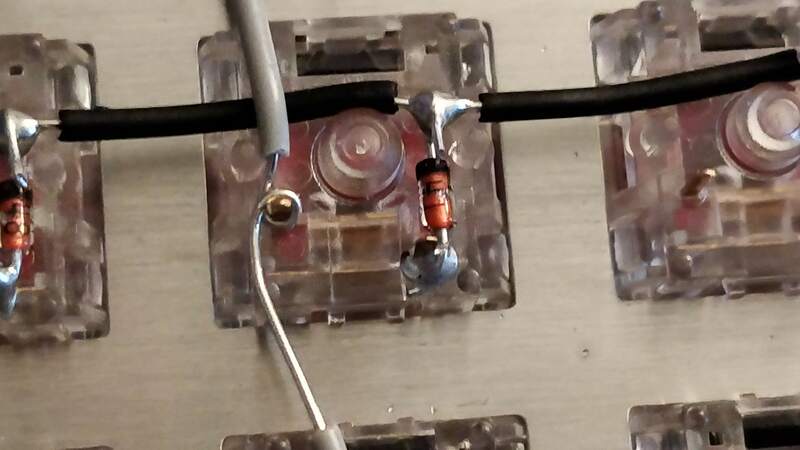 We’ll have to solder the diodes on the switch pin connected to a row. Since there’s no circuit copper pads to put the solder on like on a PCB, the best way to solder something on a pin is to form a small wire loop and put solder on it. 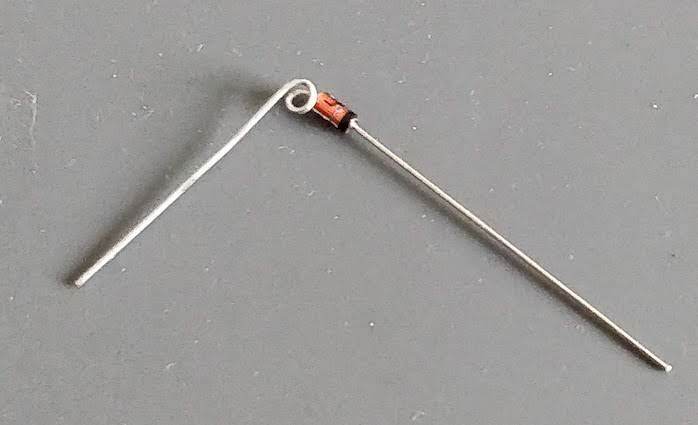 The solder will “flow” between the pin and the loop and stick firmly. Next, remove the diodes from the strip, and using a tweezer block the wire in it and form a loop by turning around the diode leg. With the tweezer you can make sure the loop is flat. Make sure the loop is big enough to be placed on a switch pin, if not open it a little bit with the tweezers. Repeat this for the other 46 diodes. Make sure to orient correctly the diodes and leave the other leg correctly aligned. Notice that I started placing and soldering the diodes from the top row (as seen from the back) so that the other rows diodes long legs doesn’t hinder soldering the next row. It is important to not cut the remaining leg yet. We’ll use it to connect to the row wire as you’ll find in the next step. To build the rows, we’ll take a long piece of wire (I used black wire). The first thing to do is to remove the insulator at the loose end on something like 5cm with the wire stripper. We know that we have 12 switches on a row (except the bottom one which has only 11 switches). There is 19mm between two switches. 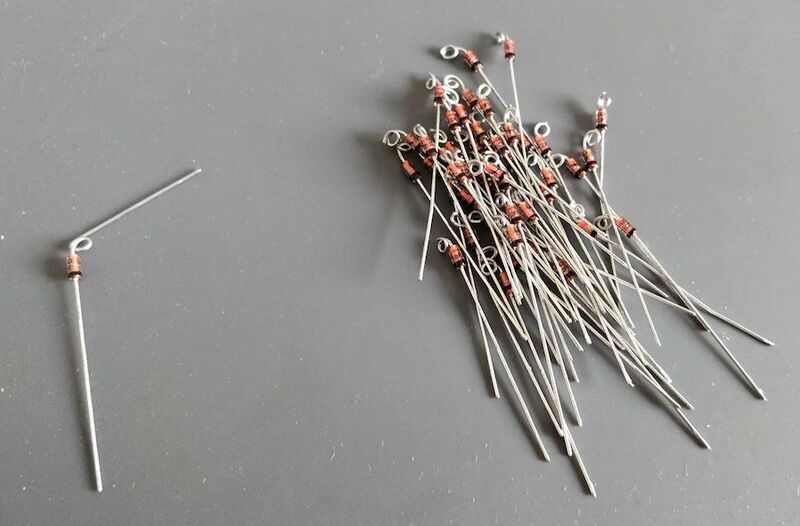 Instead of cutting 11 pieces of wire which will be hard to solder in place correctly, we’ll use only one long straight piece of wire on which we’ll split the insulator with the wire stripper into 11 pieces of around 16mm each (without cutting the cable). 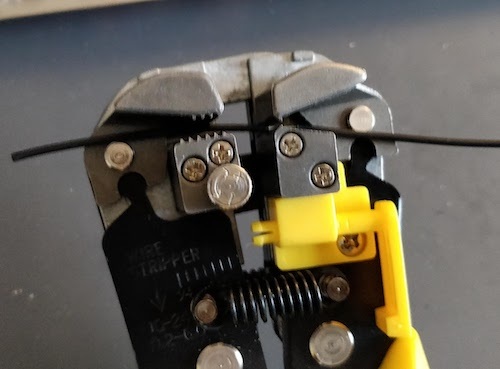 Since it is hard to correctly measure the insulator length while using the wire stripper, I used a visual clue on the wire stripper to approximate the correct length and aligned the insulator pieces with it before cutting. To solder the wire, we’re going to bend the diode leg around the cable to form a half loop and solder between the insulator pieces. At the same time secure the row wire with the switch central bumps. For the first diode, I formed a complete loop with the leg around the wire. 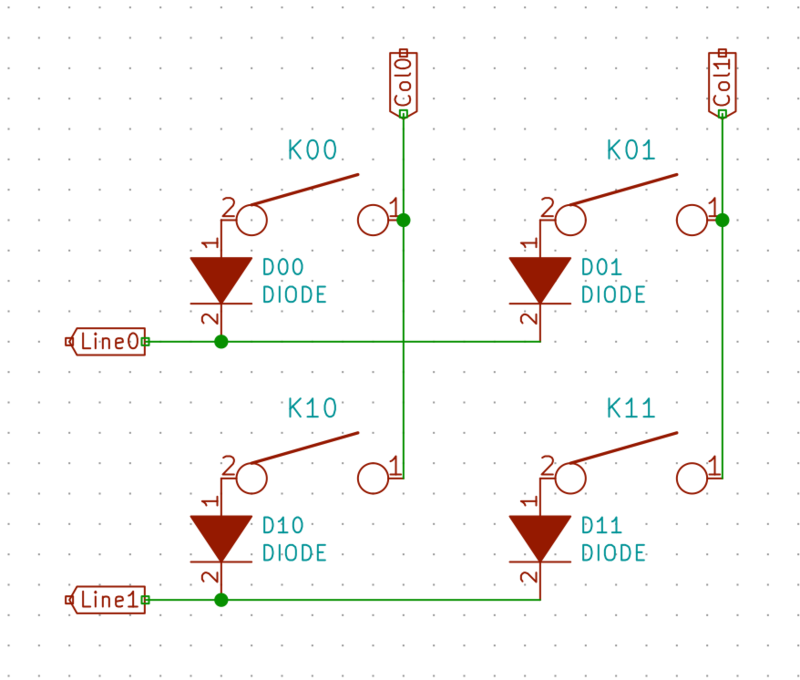 For the subsequent diode since it is not practical to do that, I’ve done only half loops. Another option which I used at first is to cut the insulator with the wire stripper on each step instead of cutting the 11 pieces at once. So solder one diode leg, cut the insulator at the right lenght, push it toward the last soldered diode, solder the next one, and so on. This is more effective if the distance between switches is variable, otherwise use the first method. The last diode in the row should also be soldered by forming a full loop with the diode leg around the wire. 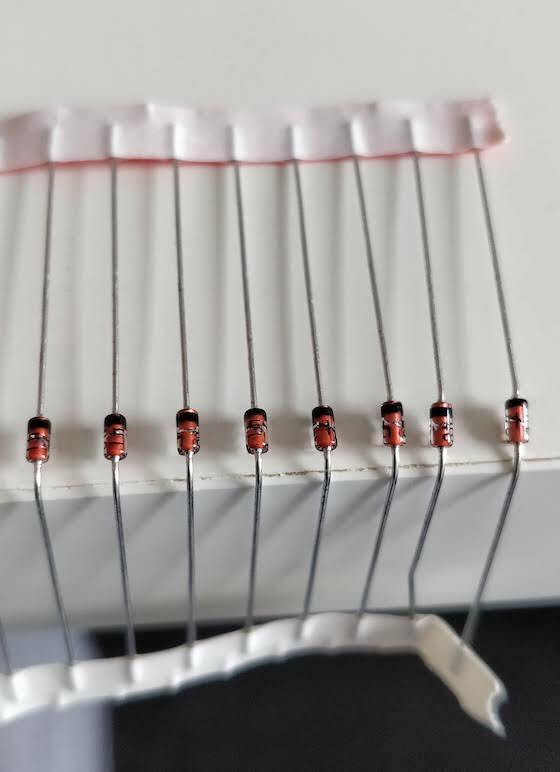 It is important to solder the diode leg on the wire before moving to the next diode leg along the row, otherwise the cable could move during the process and nothing would be correctly aligned. At this stage, you can check with a multimeter that each switch is correctly connected to the wire. Use the multimeter in continuity mode (the multimeter will beep if there is continuity between two junctions), and put the black electrode on one row end and place the red one on every diode junction, there should be a beep. 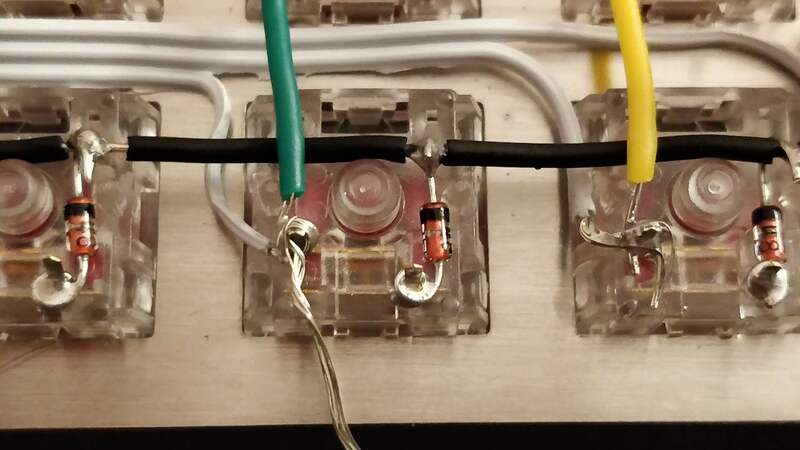 You can also test the continuity of the switches and diodes combination: still with the black electrode on the row, place the red one on the other switch pin and press the switch: the multimeter should beep. Once you’ve made sure everything works electrically, it is time to move to the columns wiring. For a better visual effect, I’ve decided to wire each column with a different wire color. Unfortunately I couldn’t find 12 different wire colors, so I’ve used only 6 that I repeated twice. I arranged the colors in an approximation of a rainbow. 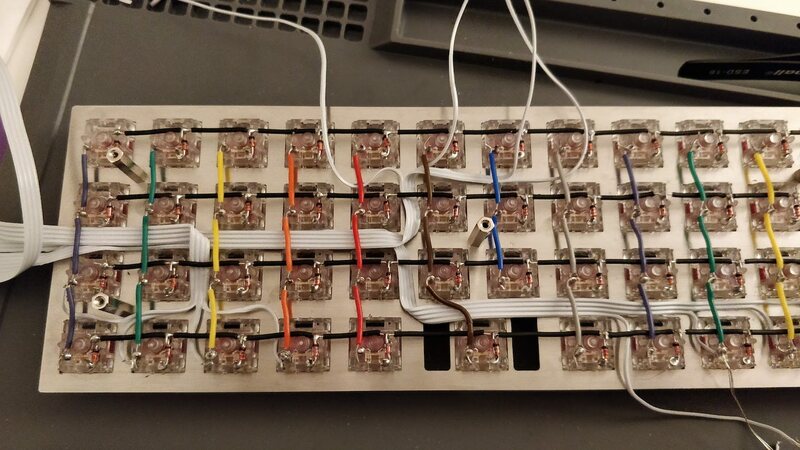 We’ll use the exact same technique as for the rows, except that we need to split the insulator into only 3 pieces of equal length (there are only 4 rows on this keyboard). To make sure we have enough wire, I didn’t cut it before soldering the last switch in a column. Keep doing this until you’ve done all columns. It takes only a few minute per columns once we get the habit. 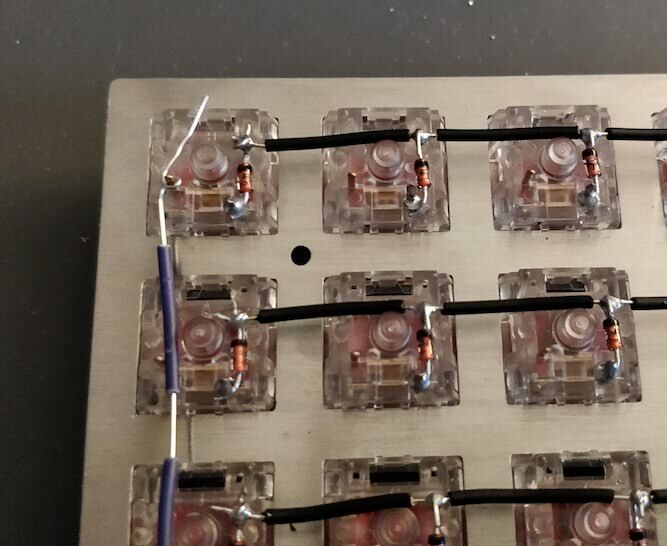 Since there are only 11 switches on the bottom row, one of the column will span only 3 switches. You can then use the multimeter to check the colums are correctly wired, and that no rows is electrically connected to a column. 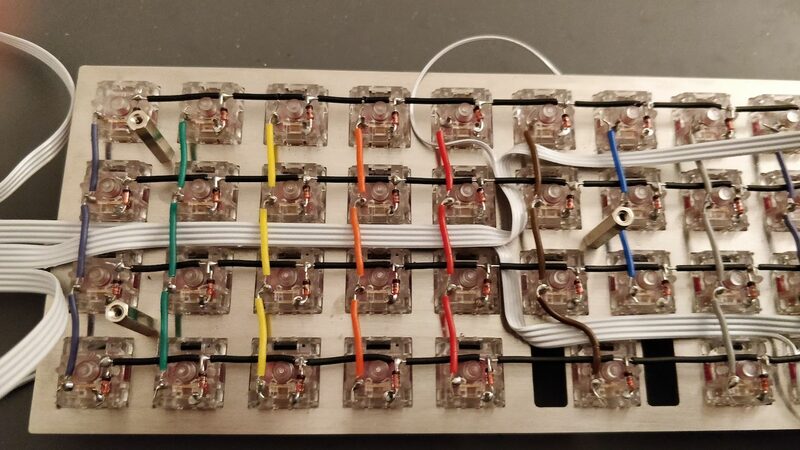 In the handwired build log part 2, I’ll explain how to connect the controller to the matrix and how to program the controller to become a working keyboard. We’ll also put some keycaps on. Another part will explain how I’m going to build a bottom plate for the keyboard.